May and June see many young men and young women reach mission eligibility. Finished with school, past the minimum age requirement, their call can be on the way within a month—that is, if they finish their submission requirements and papers by then. Six months go by in a blink, especially when appointments have to be scheduled and recommendations must be submitted. This takes time, but you’re not without help. You have resources at the ward and stake level as you prepare for your mission. Wards are the first support for prospective missionaries. Leaders are there to see them through from youth programs to the call and through lifelong church service. The bishop holds the keys for departing missionaries, as he is the first authority to recommend a prospective missionary for service. He will be the one to provide the preparation checklists, and can direct you to groups or businesses that may help in delicate financial cases. Every missionary’s journey is different, especially in early stages. The same principles for effective missionary work and a successful transition to the field are taught in the Young Men and Young Women programs. For more teaching and fellowshipping practice, see the ward mission leader. Turn to him and accompany the ward missionaries in their rounds, serving the ward and the non-member community within your ward boundaries. Finally, your local mission and active missionaries welcome the chance to help enthusiastic and engaged prospective missionaries. Make time to serve with them, accompany them to lessons or events to see what missionary work is really like. They may also have some suggestions about reading material, advice on skills to practice, and insights into mission leadership and organization. 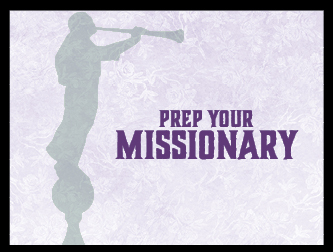 Your local stake has still more resources to aid the preparing missionary. Many stakes arrange a mission preparation course. The Mesa Kimball East Stake’s mission prep course is taught by Brother and Sister Murset. Like many called to teach these classes, they have been on several missions and lend their immense experience to the church-provided curriculum. The stake is a wonderful network of talented people, and your bishop may have some recommendations as to members who can help check off items for your papers. Obviously each stake is different, but refer any difficulties you have to your bishop, mission prep teachers, and priesthood leadership. They want to help and are willing to assist you. Family and friends should never be discounted in the process of mission preparation. Communicate with the people important to you, and ask for their emotional and spiritual support. Cultivate the relationships you want to keep, or let go the ones that need to be let go. In the last several months, many missionaries decide to cut down their romantic pursuits or frankly discuss how to keep in touch in a healthy way. Mission preparation is a long-term project, and now is the time to work on the final checklist. Get with your bishop, schedule appointments, and set goals to give time for effective execution. Family History Apps For Everyone! Hometown Tourist: Get to Know Fountain Hills!